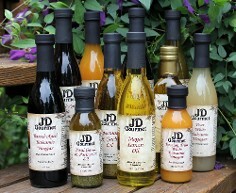 Enhance your next meal with pure balsamic vinegar and olive oil from JD Gourmet. From barrel-aged chocolate vinegar to 100% extra virgin oil, you simply won't find such a diverse selection of gourmet barrel-aged balsamic vinegars and olive oils anywhere else. JD Gourmet offers 100% pure balsamic vinegar barrel-aged by artisan food producers in Modena, Italy. We offer unique marinades, such as our Cabernet and roasted garlic marinade made from wine vinegar and a delicious blend of California Cabernet, grape seed oil, and garlic infused with flavorful spices. Our famous Chardonnay and roasted garlic marinade is made from a blend of Chardonnay, grape seed oil, lemon, and sage with spices. Contact JD Gourmet at (888) 976-7155 for the absolute best selection of Balsamic Vinegar and Olive Oil.